Football news: West Brom splash cash on Brown Ideye. West Brom splash cash on Brown Ideye. WBA sign Ideye for record transfer fee. West Brom have signed Brown Ideye for a club record transfer fee from Dynamo Kiev. The Nigerian international has signed a 3-year contract, with an option for a further 12-months, after agreeing personal terms and passing a medical with the club. The signing tweeted:"done deal, official Bromwich Albion player, thank you God. "Dream come true EPL.Would like to thank my family and my agent. WBA manager said on the club's website:"Brown is a quality striker and i'm looking foward to working with him. "He is a strong, quick, powerful player who likes to get in behind defences and has plenty of Champions League and International experience. Technical Director Terry Burton also added:"I can see that he really wants to be here and that he really wants to be playing in the Premier League. "He is a dynamic player who likes to get in behind defenders and he has pace to do so. "We are looking foward to seeing him play for the club and scoring goals. 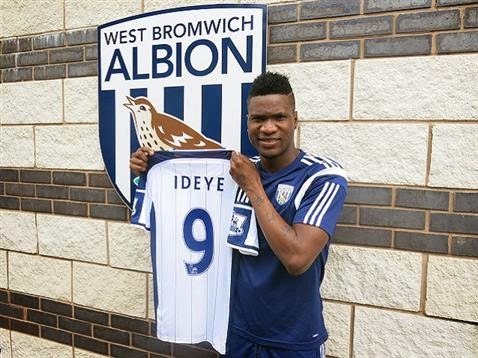 The £9 million that brings Ideye to WBA is a record transfer fee, and Ideye would wear the no 9 shirt.